KM... WEST OF THE AZORES ISLANDS. GUSTS. SOME STRENGTHENING IS FORECAST DURING THE NEXT 24 HOURS. - So Long Nate and Thanks for NOT Coming! will be that much fuller. We don't take our luck for granted! The most recent advisory this morning has Hurricane Nate passing 107 miles to the southeast of Jamaica by 1:00pm today. 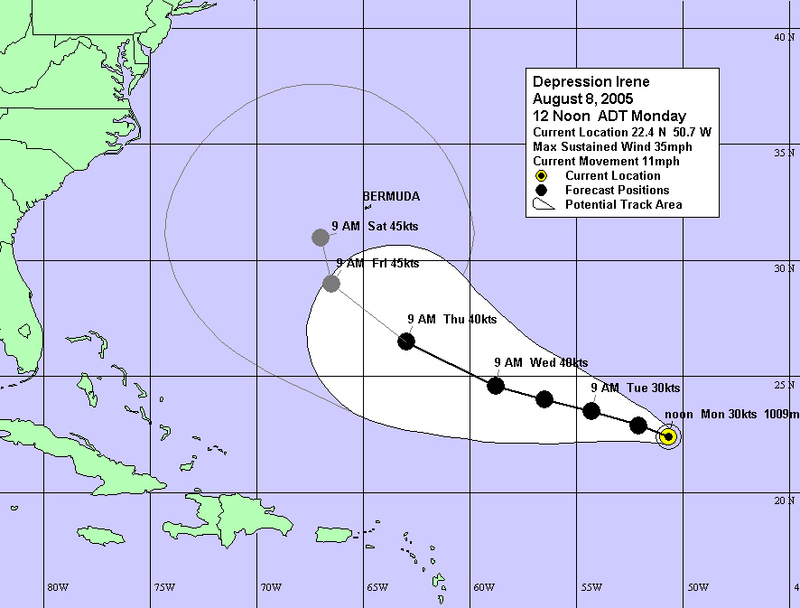 The Hurricane watch is now changed to a tropical storm warning. All schools, offices, public transportation, and other services will be on regular schedules. Bermuda is breathing a collective sigh of relief at this point wishing the storm even further away. Overnight, winds gusted at a maximum of 44 mph. with squally rain showers. The condition is expected to remain like this for the rest of the day as Nate moves away. It is expected that Friday and Saturday will be both "Bermudaful days"
Bermuda is getting ready for anything that Nate may offer. Even the ants are actively trying to get inside the house out of the way of the storm. This indicates that they sense that the storm is heading this way. The EMO met earlier today and is advising that we be prepared. This is an advice that no one needs to hear a second time. After seeing what Katrina did to the gulf states, Bermudians have decided not to take any chance but to get ready for what is now a category 1 hurricane..
One of my neighbor took his boat out of the water this morning another is prepared with sheets of ply. The supermarkets and the gas stations are doing more business than usual. The recommendation from the government is that schools and businesses be open for tomorrow, with the understanding that they could be asked to close by early afternoon. 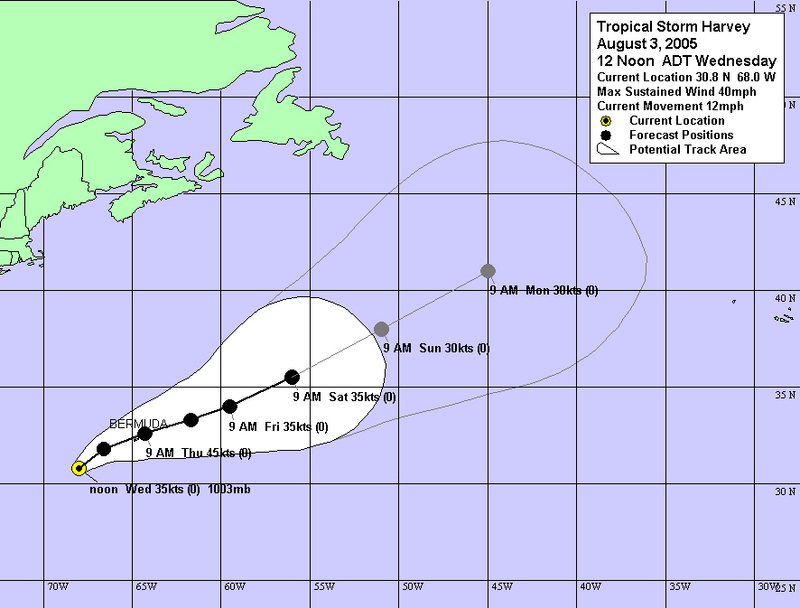 All this depends on the track that Nate chooses as she gets closer to Bermuda. There is a sense island-wide of "I hope this one also passes far out at sea but if not I will be ready." Well Nate and Bermuda seem to be in the middle of a match of tug 'o war! the Island tomorrow at 5 pm with wind speeds of 80 knots gusts to 100.
north-easterly turn. We are watching very closely. changes as yet so its business as usual. (like with Emily in '87)!!! the forecast period, otherwise an absolutely Bermudaful day here today! Harvey passed us by early this morning leaving just rain showers. While there were no power outages, airlines took precautions and cancelled flights to the island but are currently reevaluating the situation are likely to resume, if only on a delayed basis. Only one cruise ship departed early, the others left on schedule. I visited my barber this morning and he said to me in a voice that sounded disappointed, “I thought there was suppose to be a storm or an hurricane last night” That summed up the feelings on the morning after. dark clouds but there are some areas of blue beginning to show. That's it from Bermuda for the moment, will report any changes. - Tropical Storm Harvey threatening Bermuda. 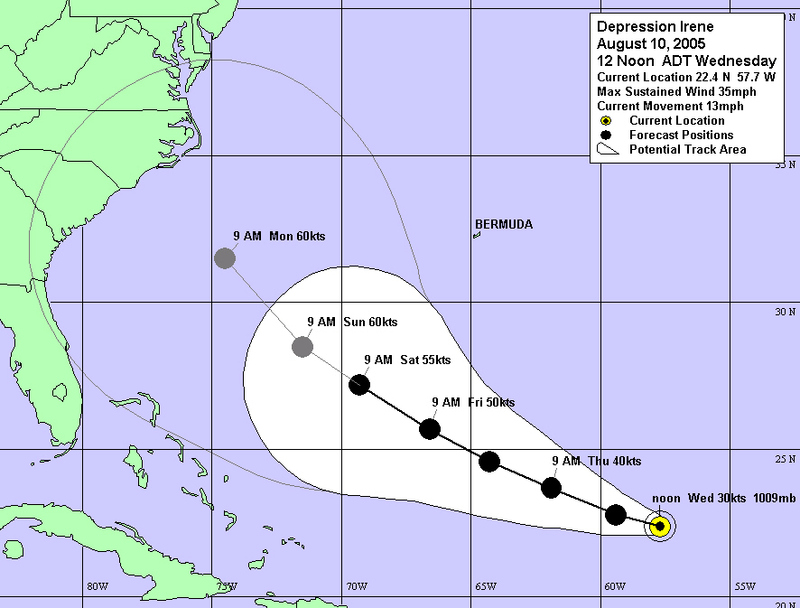 A tropical storm watch was issued for Bermuda on Wednesday August 3. Tropical Storm Harvey is expected to pass over Bermuda beginning Wednesday night to Thursday morning. Well it is now 11:25 pm Thursday night and outside is calm and quiet except for the whistling frogs. and night insects. It rained on and off earlier today. But it has being raining a lot in parts of the island over the past week. This is welcome news since a dry spell over during June and July emptied tanks, and created island wide water shortage. This even forced the Government to import water in a water tanker ship from Philadelphia. USA. Most Bermudians will wish that Harvey will produces "tank rain" but no damaging winds. The signs are however pointing to winds of 50 mph gusting to 60 mph. Harvey is presently a slow moving storm at 8 knots meaning it will have a lot of time for its wind to swirl some things around. Bermudians are however going about business as usual, seeming to take the impending arrival of Harvey in stride. INTENSITY FOR HARVEY...AND TO UPDATE THE WIND RADII. THE FLIGHT CREW MADE A VISUAL ESTIMATE OF 60 KT SURFACE WINDS. TROPICAL STORM HARVEY is a threat to Bermuda. Will provide more information as things change!